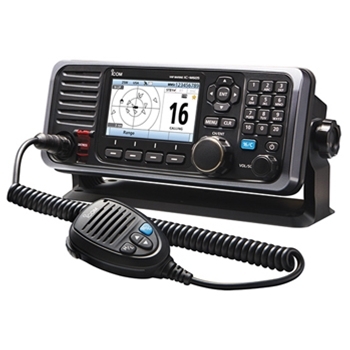 The M605 21 from Icom is a full featured fixed mount VHF radio delivering the full 25W of power that is allowed, and including an integrated AIS receiver. Bringing flexibility to your entire boat, allowing the radio to be controlled by up to three controllers an RC-M600 Command Head or HM-195 CommandMic or any combination of them. The display on the M605 21 is a 4.3” color which provides nearly 180’ viewing angle, with even a night mode to furnish you with optimal viewing brightness after dark. The integrated AIS Receiver of the IC-M605 21 will show real time AIS vessel traffic and give you the opportunity to directly call a selected AIS Target from the screen. In addition to a full function VHF Radio the M605 21 can be interfaced into your NMEA 2000 network or connect to your plotter using NMEA 0183. Of course the M605 21 radio has the standard features Icom is famous for like, Active Noise Cancelling, Intuitive User Interface, Last Call Voice Recording and Private Conversation. Loaded with features and expandability the M605 21 is a radio that offers quality ease of use and features that not many VHF radios offer. **Please Note If connecting an HM195 or HM195G to the M605 you will require an OPC2384 Conversion Cable. Each Icom M605 comes with: Icom M605 with AIS, Speaker Microphone, HM-205RB, GNSS Antenna, UX-241, Microphone Hanger, DC power Cable, Mounting Bracket Kit and a Three Year Warranty. The Icom HM195G Command mic IV offers full control of your Icom M424 or M506 VHF Radio from a remote location like a bridge or salon. The HM 195 can also be used as an intercom with the M424. Icom's OPC2384 12-pin to 8-pin conversion cable is required to connect HM195/HM195G CommandMics to M605 Fixed Mount Radios.